Los Angeles beaches are among the city's most endearing assets, and in many ways they are a salvation for residents of this sprawling city. Given incredible auto access via the Pacific Coast Highway and bicycle and pedestrian access on corridors such as The Strand, a full immersion into a world of natural elements is never too far away from the concrete jungle, and millions take advantage of the opportunity every year. Most of these beaches feature restrooms, showers, and lifeguards, and many more also include nearby restaurants or snack shacks, so planning really doesn't take much effort. And this city has a beach setting for every taste: Looking for some downtime in a quiet setting? Head to some of the northern options near Malibu and beyond. Interested in a taste of the culture and some people watching? Try the piers, shops, and busy paths along the South Bay beaches. Whether you are surfing, playing volleyball, skateboarding, biking, paddleboarding, scuba diving, kiteboarding, or even just stretching out for a few hours of leisure, you haven't really lived an L.A. vibe until you've lost yourself in the sand and surf. You know you're doing something right if you have the time to thoroughly vet all of L.A.'s beaches, but in case this isn't a likely scenario for you, we've assembled a list of some of our favorites below. A slightly broader list is included in the Featured Adventures section, as well. Each beach has its own individual character, so we find that rank isn't as important as personal fit. Also, keep in mind that local weather may keep one spot fogged in as the weather blows out over another stretch farther away. Play the field a bit and take advantage of the variety to develop your own portfolio of beach options; this is L.A., and you can! And don't forget to share your photos and updates in the trip comments sections when you return. Zuma Beach County Park + Westward Beach: Zuma and Westward together create 3 miles of beach that is easily accessible from the Pacific Coast Highway and consistently ranks among L.A.'s favorites. There is excellent surf if you can handle the rip currents, and the water (and beach) is a little cleaner this far north. Restaurants, volleyball courts, and snack stations round out the amenities. Point Dume State Beach: Really an extension of the Zuma and Westward area, Point Dume is a popular choice to come for gray whale spotting, and the Point Dume State Marine Reserve and the Point Dume State Marine Conservation area are excellent spots for scuba diving. Paradise Cove Beach + Cafe: Grab a bite and a drink on the beach and watch the sunset? A beachside brunch? Why wouldn't you? This mellow cove and restaurant is an L.A. icon. While you do have to pay to access the beach, the scene is worth the price of admission. Definitely one of Malibu's best. El Matador State Beach: One of three beaches that constitute Robert H. Meyer Memorial Beach, El Matador is small...but it makes up for its size with its iconic rock formations and dramatic bluffs. Catch a sunset here if you can. 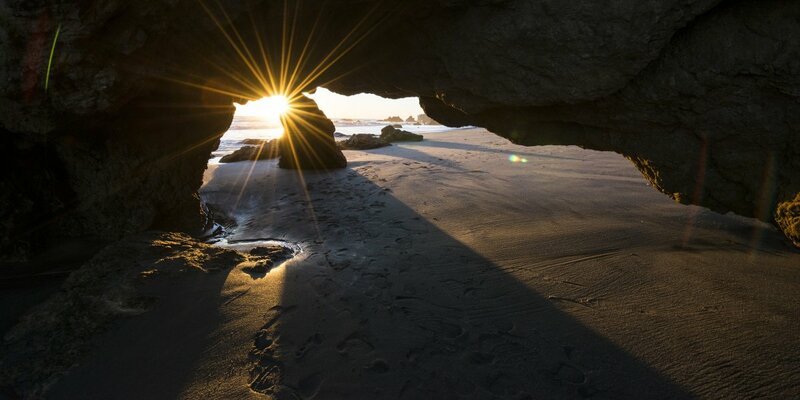 Sunset at El Matador State Beach. Photo by Tyson Gillard. Malibu Lagoon State Beach + Surfrider Beach: This world surfing reserve with a historic break is also a lagoon with a robust population of birds for wildlife viewing. Visit the historic Adamson house for a tour of the tiles and the Malibu Lagoon Museum. Abalone Cove Shoreline Park: It may take a little longer to reach Abalone, but the tide pools and wildlife viewing opportunities can be worth it. The beach is protected by the headland, creating a perfect natural shelter for a calm beach spread or tide pool exploration with the kids. Manhattan Beach + Pier: Hugely popular, ultra accessible, and obviously subject to crowds, Manhattan Beach is an L.A. classic. Surfing near the pier, volleyball on the beach, rolling on The Strand, grabbing a bite from the vendors...this is an easy spot to pass a few hours or an entire day. Venice Beach: There may be no better beach for people watching, and Venice Beach draws an eclectic crowd that quickly becomes part of the attraction. Skate parks, incredible graffiti, Muscle Beach, funky shops and restaurants, and a constant procession of characters along The Strand: Venice Beach is a legendary part of L.A.'s beach culture. Leo Carrillo State Beach: Another great spot for tide pools with the kids, this cozy cove is a bit of a haul from the city but rewards with clean water, clean sand, and slightly smaller crowds. Plus, it's beautiful; there's a reason filmmakers have chosen Leo Carrillo State Beach as a film site for films like "Inception," "The Karate Kid," "Grease," "Pirates of the Caribbean," "Point Break," and, of course, "Beach Girls and the Monster." Will Rogers State Beach: Of the South Bay beaches, Will Rogers tends to have the cleanest water, making this a popular choice for families and those getting out on or into the water. Nearby Santa Monica tends to draw more crowds, leaving Will Rogers with a little more breathing room much of the time.